Single Station / 4 Cavity Rotary Auto De-flashing Fully Automatic #Plastic Extrusion Blow Molding Machine.Suitable to make containers in Blow HDPE; LDPE; PP PVC Materials. Bottle Application: Medical, Pharma, Ayurvedic or Herbal etc. 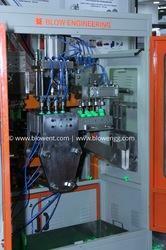 Looking for Multi Cavity Auto Deflashing Blow Molding Machine ?